Published Sep 17, 2018 by Addison-Wesley Professional. Google officially announced Kotlin as a first-class language for Android development, which makes it the only language apart from Java officially supported on the platform. Adoption of Kotlin is growing steadily since its release of version 1.0 in 2016. With companies like Netflix, Uber, Pinterest, and Trello actively using it, we can expect the adoption of Kotlin to grow significantly in the near future. There is very little pointed and in-depth coverage from developers for developers at this stage. 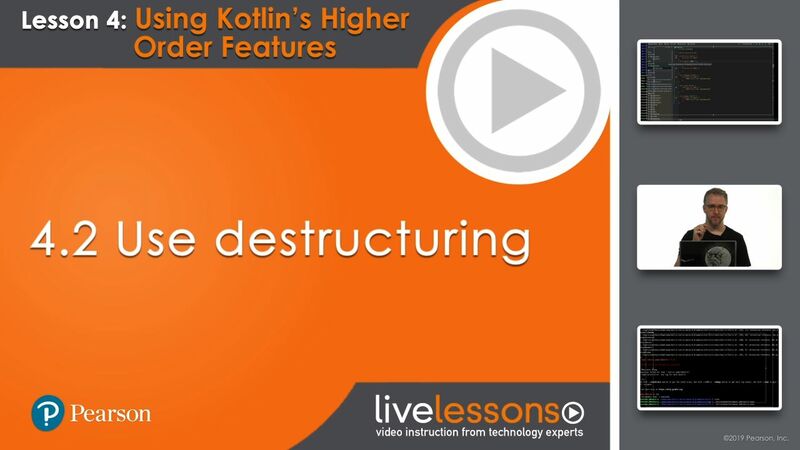 With Kotlin from the Ground Up LiveLessons, we attempt to fulfill the requirements of developers who want to get acquainted with Kotlin and its features. Kotlin was designed to be an industrial-strength, object-oriented language—and a "better language" than Java—but still be fully interoperable with Java code, allowing companies to make a gradual migration from Java to Kotlin. Kotlin is one of the most exciting new languages to come along in some time. Built with pragmatism and interoperability in mind, Kotlin is one of the easier languages to transition to for many Java developers. However, many who come to Kotlin are not coming from a Java background at all. In this course, we take a look at Kotlin from the ground up and cover the topics necessary for a solid understanding of Kotlin. In this course, we cover the basics of the language as well as delve in to some of the trickier aspects. We address topics such as builds and testing, generics, and extension functions. We even take a look at how Kotlin can help you write your own DSLs. We build up a tool set to help make you the most productive and happy Kotlin developer you can be. While there are a number of comparisons to Java throughout the material, Java knowledge or expertise is not required. These comparisons are largely used to highlight where Kotlin diverges from Java for the sake of those in the audience coming to Kotlin from Java.